The Museum of Contemporary Art Yinchuan, located within a large organic plantation, is the first contemporary art museum in northwest China. Striving to promote diversify in the development of contemporary art, MOCA Yinchuan is the first to be dedicated to Chinese and Islamic contemporary art. 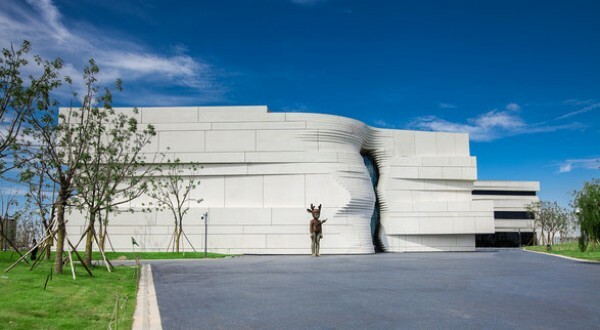 The Museum of Contemporary Art Yinchuan, encompassing 15,000 square meters, is situated along the western banks of the Yellow River and surrounded by natural wetlands. Throughout its long history, this important stop on the Silk Road has always served as a cultural crossroad. Here, East meets West, and a diverse array of cultural influences, from Islam to Xixia, Hetao to Dangxiang, have continually fused together to create a uniquely open and diverse melting pot. MOCA Yinchuan, will strive to promote contemporary art exchange, exhibition, collection and public education between China and Islamic countries with the support of Ningxia Minsheng Culture and the Arts Foundation, covering all forms of visual art, architecture, design and fashion. The MOCA Yinchuan Collection includes several hundred works of Chinese oil paintings in late Qing dynasty, antique maps detailing early Sino-Western exchange, and Chinese contemporary artworks. These collections form a foundation for the research of Chinese art history and exchanges between East and West, and contemporary art in China and Islamic countries. Every two years in September, the“China-Arab States Expo” will bring leaders from some 60 Islamic countries to take part in a wide range of cultural exchange activities. To coincide with this event, MOCA Yinchuan will present an exhibition focusing on the special guest nation for that year, presenting works of Islamic culture and contemporary art.